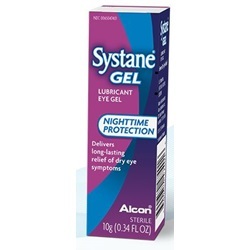 Systane is a sterile lubricating Hypromellose eye gel 0.3%, in a 10 gm tube. Overnight protection delivering long-lasting relief of dry eye symptoms. Manufacturer: Alcon. NDC: 00065047401. Comes as singles.